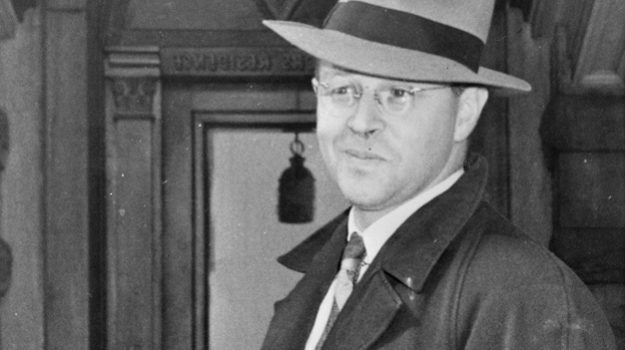 A member of Ontario’s social and economic elite, J.R. Cartwright was involved in several high-profile cases and was a well-known attorney by 1945. In that year, he acted as lead counsel for the Cooperative Committee on Japanese Canadians, which challenged Parliament’s deportation orders. He later served as the lead Crown prosecutor in most of the Gouzenko spy trials. Cartwright was eventually appointed to the Supreme Court of Canada, where he later became chief justice. He handed down many decisions during his long career: in the Saumur and Roncarelli cases, he joined Gérald Fauteux in dissenting from the majority decision, but he supported the majority ruling in the Padlock case. “was born in Toronto, Ontario, on March 23, 1895. He was the son of James Strachan Cartwright and Jane Elizabeth Young. After graduating from Upper Canada College in 1912, he enrolled at Osgoode Hall Law School and began his articles with Smith, Rae & Greer. He interrupted his studies in 1914 to serve overseas with the armed forces during the First World War. In 1915 he was wounded twice and for the following two years was an aide-de-camp to three successive generals. He was awarded the Military Cross in 1917. Upon his return to Canada, he resumed his study of law. He was called to the bar in 1920, then joined the firm of Smith, Rae & Greer in Toronto. In 1947 he was counsel for the Government of Canada in the prosecutions that resulted from the findings of the Royal Commission on Spying Activities in Canada, which had been chaired by judges Taschereau and Kellock. He was appointed to the Supreme Court of Canada on December 22, 1949 and became its chief justice on September 1, 1967. He served on the Supreme Court for 20 years and retired on March 23, 1970. Chief Justice Cartwright died on November 24, 1979, at the age of 84” (Supreme Court of Canada, www.scc-csc.gc.ca).